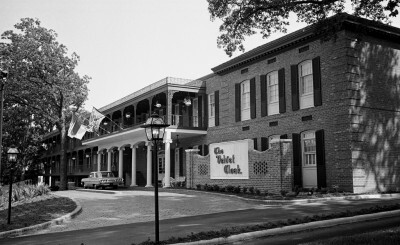 The Velvet Cloak Inn, “Enjoy the Velvet Touch,” Raleigh, N.C. This week Flashback Friday checks in at Raleigh’s once prestigious luxury hotel, The Velvet Cloak Inn. Sadly, just as in the legend of the cloak of Elizabethan courtier, Sir Walter Raleigh, the City of Raleigh’s namesake, the Velvet Cloak is nowadays covered in mud. 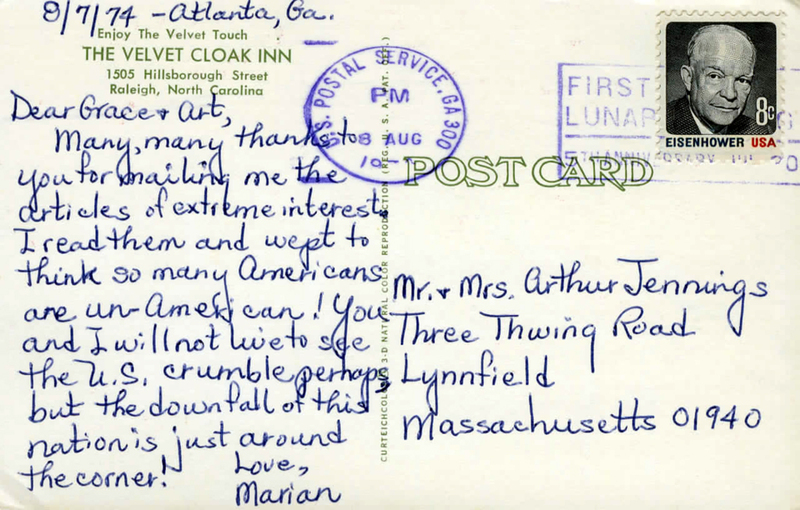 This week’s card was postmarked on August 8, 1974. Many, many thanks to you for mailing me the articles of extreme interest. I read them and wept to think so many Americans are un-American! You and I will not live to see the U.S. crumble, perhaps, but the downfall of this nation is just around the corner! 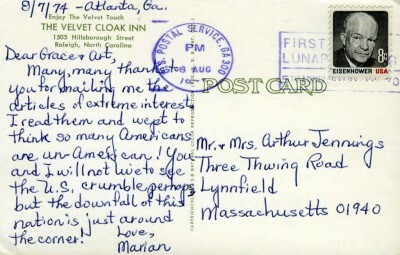 A curiosity about old postcards I find intriguing is the message written on the back. If you have been following Flashback Friday since we first began posting this column, you will know that the message seldom has anything to do with the image on the front of the card. This week’s message from ‘Marian’ is a real puzzler. I can only assume she was referring to the protests against the Viet Nam War, or perhaps President Nixon’s fall from grace over the Watergate scandal. Who knows. Whatever it was that got her so riled back then, now forty years hence, the U.S. has not crumbled; though many in this country would argue still, in the context of the 21st century state of affairs, “the downfall of this nation is just around the corner.” Some things seemingly never change. The Velvet Cloak opened on Hillsboro Street just down the road from NC State University in 1962. It was Raleigh’s first hotel built outside the downtown core. Amenities included a first-rate restaurant, an elegant lobby setting, well-appointed rooms with color TV, gated parking, a glass atrium-enclosed heated pool, and a basement nightclub, the Club of Eight Lords. Everything about the Velvet Cloak was swathed in Raleigh history. The building itself was designed by Raleigh architect Leif Valand, better known as the principal architect of Cameron Village. For the Velvet Cloak he adopted a New Orleans, Old South motif, very different from his more characteristic modernist style, because, it is said, that was the look the developer wanted. Nonetheless, the elegance of the ultimate result befitted Hillsboro Street. 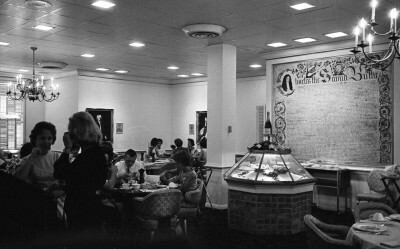 This photo shows how the Velvet Cloak appeared shortly after it opened in 1962. The dining room, below, featured a replica of the North Carolina Charter from King Charles II issued to the Eight Lords Proprietors in 1663. 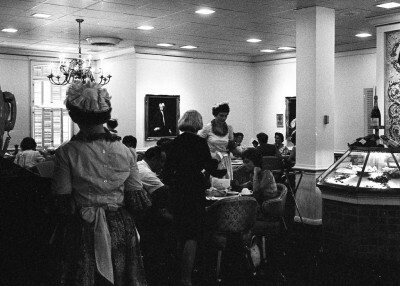 Another view of the dining room shows waitresses wearing ‘colonial’ style uniforms. As seen below, ‘bathing beauties’ lounged about the hotel’s glass-enclosed, heated tropical pool in 1963. 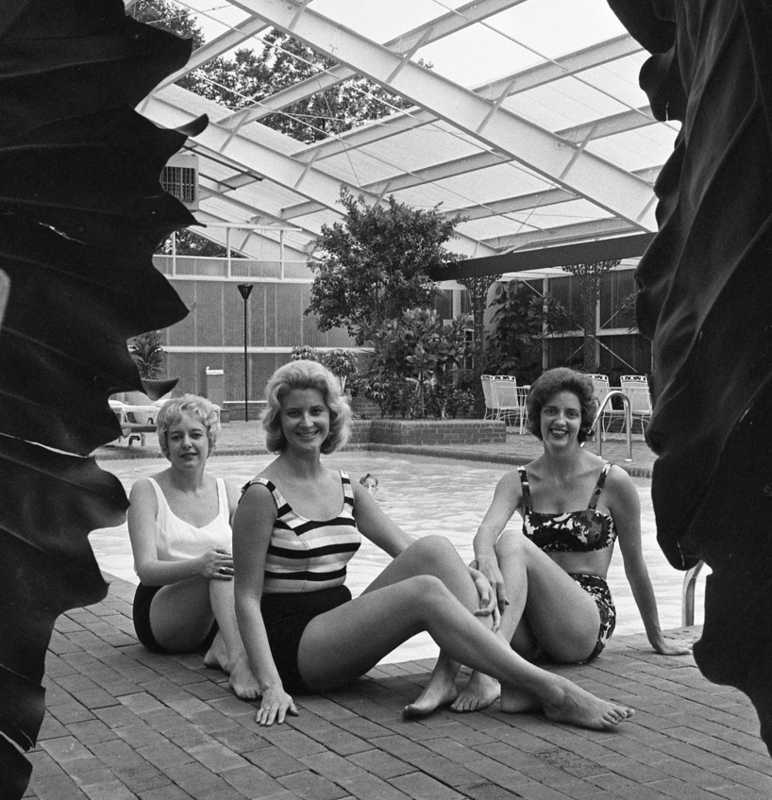 For 30 years The Velvet Cloak Inn reigned as one of Raleigh’s grandest hotels, and counted among its guests popular celebrities, state and national political dignitaries, prominent businessmen, and the Raleigh elite. Countless wedding receptions, conventions, and special events took place within its walls. Nowadays, the once elegant hostelry is a virtual derelict. 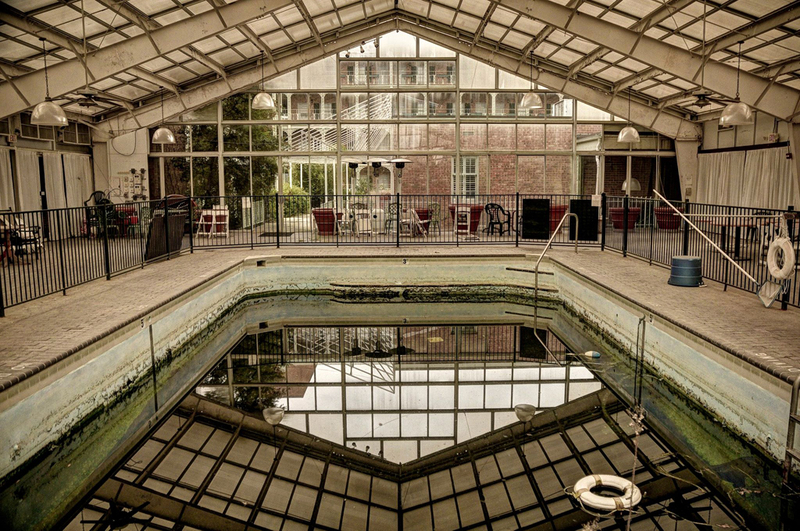 The restaurant and nightclub closed years ago, the lobby is but a shabby shadow of its original elegance, and the heated atrium pool has degenerated into a slime bog. As Raleigh grew over the decades, and as larger, ‘high end’ hotels and convention facilities sprouted throughout the Triangle, the lure of the downtown, and some would say, outdated, Velvet Cloak began to wane. 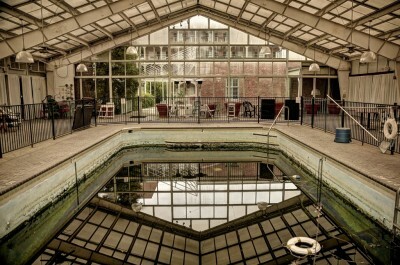 Though still popular with businessmen and a loyal NC State University clientele, the vibrant luster of the old grande dame had begun to fade by the late 1990s. A new owner purchased the property in 2005, and while still trying to function as a hotel, the developer converted many rooms to condominium units. 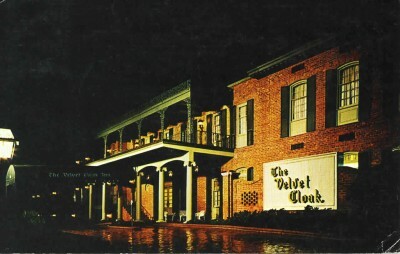 Rebranded as the Velvet Cloak Villas, the aging building subsequently was not properly maintained, customer service declined, and many of the promised amenities proved to be a sham. Ultimately, the owners offered to buy back the condo units at a quarter of the original $80,000 purchase price. Although many residents felt they had been scammed, most took the buyout. Today only a handful still occupy their units. In case you want to learn all the gory details of the Velvet Cloak debacle, the IndyWeek published a full expose last summer. As a sad visual endnote, Goodnight Raleigh photographer Ian F.G. Dunn recently took these photos of the now abandoned, yet once bathing beauty-draped atrium swimming pool. This single life preserver floating in the algae-infested pool says it all, doesn’t it. A major publisher and printer. Their U.S. factories turned out more cards in quantity than any other printer. They published a wide range of national view-cards of America and Canada. Many consider them one of the finest producers of White Border Cards. The Linen Type postcard came about through their innovations as they pioneered the use of offset lithography. They were purchased by Regensteiner Publishers in 1974 which continued to print cards at the Chicago plant until 1978. “Flashback Friday” is a weekly feature of Goodnight, Raleigh! in which we showcase vintage postcards depicting our historic capital city. We hope you enjoy this week end treat! Disgraceful. 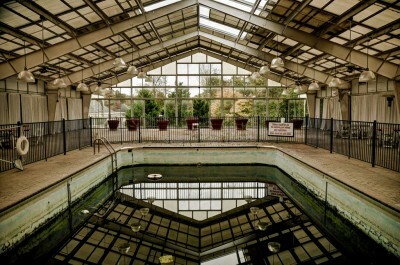 To me, it is sad that many of the buildings that have made Raleigh unique have either been bulldozed (the Plantation Inn replaced by yet another Best Buy) or have been allowed to fall into complete disrepair. We are losing our charm, and becoming yet another homogenized, generic city. New to Raleigh & walk past this place all the time-have been curious about “the deal” there. Thanks for this. Richard Nixon resigned on 09 August 1974 a day after the postcard was cancelled. While I never saw The Velvet Cloak Inn during its heyday, I did live across and up the street from it in the early 90s. I walked by it and often wondered what it looked like on the inside. Thanks for the informational blog post and the IndyWeek link. I hope someone will try to preserve/repurpose The Velvet Cloak Inn. It is sad. My family lived there for 6 wks after moving to Raleigh in ’66. In ’74, my beloved wife & I had our rehearsal dinner around the still elegant pool, It was a wonderful memory. Heres a toast to a once magnificent institution. I salute you at your finest and remember you fondly. My family history is somewhat intertwined with this place. My father worked there as a bell hop in the 60’s and waited on famous customers like Louis Armstrong, Fay Wray, Forrest Tucker, and Sonny and Cher. My Mom was a cocktail waitress at the House of 8 Lords club there. I appeared several years ago in a television show in Japan where curiously enough one of my scenes was shot around the then still clean and functional pool. It’s a real shame that such a great Raleigh icon has degenerated so badly. Yes, I, too have fond memories of the old Velvet Cloak. For important family events, we’d go there and enjoy their buffet meals. It was a special place to go, back then. Shortly after my wife and I were married, we served as chaperones for a dinner-dance that her sorority was sponsoring at the Velvet Cloak. One of my high school friends was the manager there. I concur with Paul, it is a shame that the old Raleigh landmarks are systematically being eliminated. When I got married in December 1974 we were too broke to go on a honeymoon so we spent the night at the Velvet Cloak. The bridal suite was already booked but they put us in another lovely room. The room service and kitchen staff was on strike so instead the gave us vouchers for IHOP and a future meal at the restaurant there. When we checked out they found out my new husband was 82nd Airborne they comped the room! BUT the best memory was there was a phone in the bathroom!! I thought that was about the fanciest thing I’d ever seen! Sad to see something so iconic for luxury in such deplorable shape. Was the first place we stayed when we moved here and were still waiting on the moving van to get to N. Raleigh from NY. I have vague memories of my sisters and I wondering about the place. Has there been any resolution to the snoot case? Back in the early-60s my family would occasionally drive over from Durham to dine at the Velvet Cloak, where they offered a “smorgasbord” on Sundays. Wow! This is sad to hear. I hope things can turn around for the Velvet Cloak. I love historical buildings and hate hearing outcomes like this! How hard do you think it will be if someone was to try and explore it? The name of the club in the basement was “Baron’s” not “8 Lords.” I worked there in the mid 60s and met many celebrities: Liberache, Bob Hope, Sonny and Cher, Tom Jones, Louis Armstrong, Peter, Paul and Mary, to mention just a few. Sally Rand, the famous fan dancer, danced there for for a few weeks. She was a personal friend of Willie York who owned the facility at the time. Joyce Hawley and Jerry Davis were two of my favorite reformers. One night after the club closed, Jerry was on his way home and stopped to get some gas at a convenience store. A robbery was in progress and he shot an killed. The murderer was never found. It was indeed a beautiful place in it’s heyday. It was the first hotel to have color TVs in each room and the most expensive in Raleigh, $21 for a single and $25 for a double. The average price elsewhere was around $8 for single room and $10 for a double. I have many, many fond memories of the Velvet Cloak Inn. Too bad it’s going to be demolished. I had to laugh when I read Laurel’s comment — my family stayed at the Velvet Cloak when I was a child, and I was amazed that there was a telephone in the wall right by the toilet! Definitely my best memory of the place. Most of the magic was gone 20 years later, when my employer had company parties there by the pool. But it was a showplace in its day. The Velvet Cloak was a great hotel and it didn’t deserve to die as horribly and as painfully as it did. I’m p.o’d, and I want to do something about it. Stay tuned, watch our website. We have a new property in development in Raleigh, as of ..now.. . . .
Didn’t the amazing vocalist Janice Hurst sing at the Velvet Cloak?